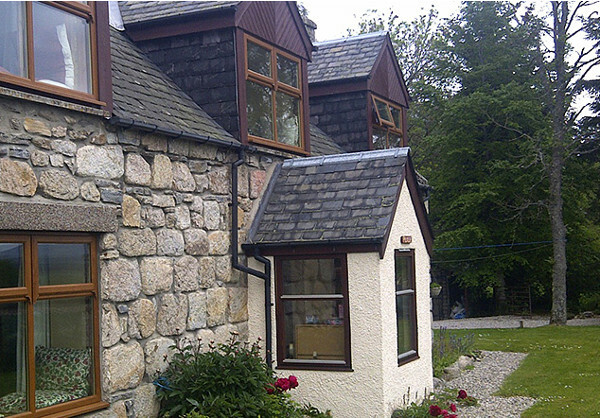 "Pilmuir" is a holiday cottage in Drumuillie, near Boat of Garten, in the Scottish Highlands. Pilmuir sleeps 7, and is ideal for a cosy family holiday to base yourself, and discover this part of Scotland. Pilmuir sleeps 7 people in 4 bedrooms, with the bedrooms being made up of 2 doubles, a twin and a single bedroom. There is an open-plan living room, dining room and kitchen, with some lovely views. You have a wood burning stove at Pilmuir too - which makes for a cosy feel after day exploring the area. The kitchen provides all you'd expect from a holiday cottage - including an Aga style range cooker, slow cooker, mixer, blender, microwave, plates and cutlery. Pilmuir is set in 3 acres of Cairngorm National Park, with the cottage having a mature garden, complete with ¼-acre of paddock. The wooden bridge at the end of the paddock provides access to the woodland. There is plenty of places to visit during your holiday at Pilmuir. The nearest village with shops, restaurants and pubs is Boat of Garten, which is about a mile from Pilmuir. Inverness is a 30 mile drive: known as the capital of Highlands, Inverness makes for nice day out. Loch Ness is also a short drive from Pilmuir, and has boat trips to spot that famous monster! Pilmuir is set in the Cairngorms National Park, with plenty of walking and cycling opportunities. Don't forget, at the end of a day walking the Cairngorms, you can put your feet up in front of that wood burning stove.